You will find this beautiful bay on the Isle of Wight – a small island just off the coast of mainland England. 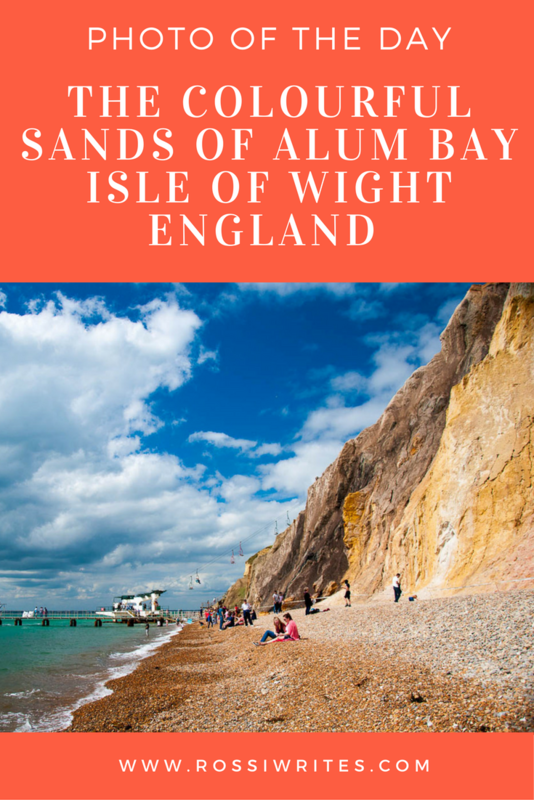 It’s called Alum Bay and it is famous for its colourful sand cliffs. The rugged, steep cliffs run almost vertically down to the turquoise sea and glisten in the sun in a staggering 21 different shades split in five main colour groups: red, green, white, yellow-brown and black. It is beautiful to see and the place has been one of the biggest attractions on the Isle of Wight since Victorian times. People would come to visit and fill up glass bottles with alternating layers of the coloured sand to take home as a memento of their visit. The souvenirs are still very popular today. In fact, a shop in the small amusement park on the clifftops specialises in just that – see-through vessels in any shape and size which you can fill up yourself from big vats with sparkly multicoloured sand. Alum Bay was the first place I visited on the Isle of Wight eight years ago. I re-visited it again this summer and, together with my family, I spent some time on the beach in the shadow of the colourful cliffs. I took this picture there trying to capture in the beauty of the place – the sea with a boat and a pier on one hand, the fabled cliffs with the chairlift on the other and the pebbly beach between the two with the scores of people who flock there every day to admire nature at her very best. Have you been to the Isle of Wight? Which landmark or attraction there did you love visiting? Let me know.